After a bounce-back season just last year, Modern Family‘s seventh season has suffered from a lack of forward momentum. A general sense of complacency has bogged down many of the episodes this season. Few storylines have felt fresh, and more often than not the characters have felt out of place within any larger narrative. Considering how complacent this season has been, it makes sense that a bottle episode would shake things up and provide one of the sole highlights of this season. “Crazy Train” certainly isn’t perfect, but it’s a consistently funny episode that serves to liven up this season before it comes to an end. With Dede getting married, the whole gang decides to head to Portland for the wedding. They’ve chosen to travel by train, presumably because it allows for the most sitcom hijinks, and that means that everyone is in close quarters, even as they travel first class. “Crazy Train” doesn’t throw every character together though, instead splitting the group up into pairs and working out stories from there. It turns out to be a smart choice, as a few storylines dovetail together while allowing for some good comedic pairings and performances. Let’s start with the worst of the bunch though because it’s indicative of why this season has felt so underwhelming. “Crazy Train” once again sees Manny and Luke teaming up, and once again that means they’re being gross bros. Modern Family has shifted the characterization of both Manny and Luke this season, as both are more hormone-driven than they’ve ever been before. Here, the two are excited to be traveling by train because apparently it’s a great place to meet women—Luke mentions “vibrations” and being “trapped” just in case you wanted to roll your eyes again—which results in Luke meeting a Geography teacher whose intentions he misconstrues, and Manny having a misunderstanding about Alex being attracted to him. It’s Modern Family’s typical comedy of errors, but much like all of Luke and Manny’s subplots this season, it falls flat because of how reductive it is. There’s only so much you can do with the idea of “teenage boys are horny,” you know? Plus, it’s just further proof of how far Modern Family has led these characters astray. Luke isn’t charming and dim anymore; he’s just obnoxious, and that doesn’t make for good comedy. Thankfully, the rest of the episode is often funny, and that makes up for how off-putting everything with Manny and Luke is. One of the best aspects of this week’s episode is the rapport between Phil and Cam. Those two always have great chemistry together, and their scenes in “Crazy Train” are no different. Here, they get excited when they see one of their favorite mystery authors, Simon Hastings, working on the final novel in his famous series. Eventually, the two get to read the first chapter, only to expose a logistical flaw in the train murder that kicks off the book, forcing Phil and Cam to try and find a way to make the story work so that Hastings doesn’t abandon his work. 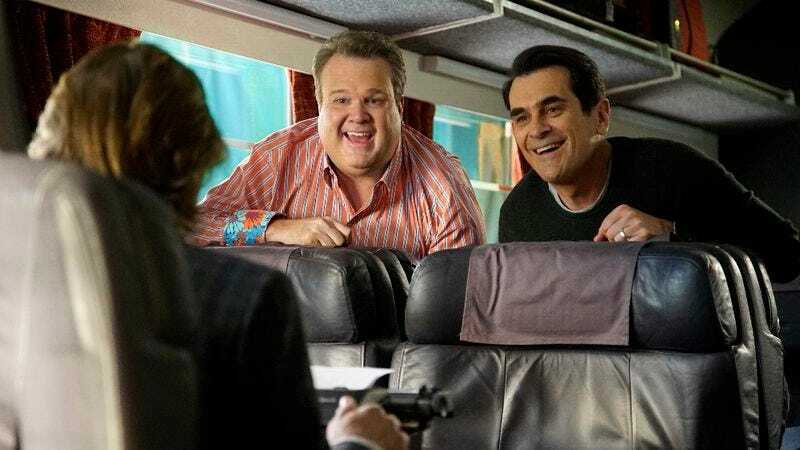 Eric Stonestreet and Ty Burrell always work well together, and this kind of setup is right in their wheelhouse. It’s the perfect balance of charming and ridiculous, meaning that it’s fun to see them fanboy out over Hastings, to see Cam showing genuine interest in Phil’s fanfic (at least until the end), and to watch as they playact various scenarios until they figure out a way to pull off the fictional murder. Sometimes just putting two good comedic actors in the right situation is all Modern Family needs to succeed. The rest of the episode isn’t exactly inspired, but it’s still the kind of low-key funny that suits this aged version of Modern Family. For instance, the idea of Gloria getting stuck in coach isn’t exactly a novel or intriguing concept, but it helps set up a few great moments. More specifically, Jay is trying to build up DeDe as a wonderful woman to the kids of the man she’s about to marry, meaning he has to pretend to not know Gloria when she finally finds him and tries to get back to first class. It’s a small moment, but it’s a rewarding one. That’s because Modern Family has always done well when it’s focused on crafting interweaving storylines. It’s part of the comedy of errors I mentioned above, and a bottle episode set inside a train proves to be a great opportunity for the show to flex some muscles it hasn’t used in awhile. So, the question becomes: can “Crazy Train” lead to a solid finale? An out-of-town wedding could really help the show shake off the complacency of this season. It could lead to a soft reset on the problems of this season and set up some stories for the next. “Crazy Train” is at least a good start, a funny, fresh episode that has the main characters feeling more like themselves. That hasn’t been an easy task for Modern Family this season, but if the show can close out strong, perhaps there’s still hope for this once-consistent sitcom. What is Manny’s character now? At least Luke’s transition from dumb/charming to unbearable makes some sense. Manny is just…there.